Season 4 of Minecraft City Champs is bringing many surprises due to the new and improved format. During our second week of Divisionals, new contenders have emerged, making this one of the most exciting seasons of City Champs of all time. We can’t wait to see who makes it into the Grand Final! Read on to see the current divisional standings and find out which matchups you should watch for next week. 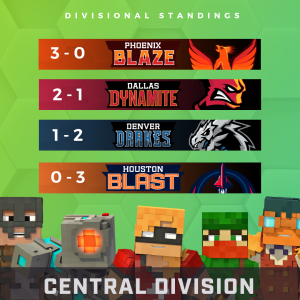 Central Division The Phoenix Blaze rose from the ashes of last season and burned brightly as they ended in 1st place in their division after defeating both Houston and Dallas through tiebreakers. Matchup to Watch: Phoenix and Dallas have a rematch next week. We’ll be watching to see if Phoenix can stay undefeated after having such narrow victories or if Dallas will reclaim what is rightfully theirs. 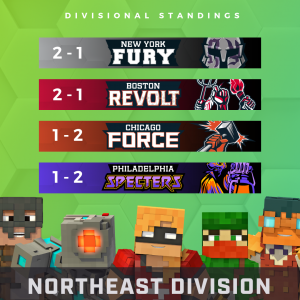 Northeast Division Boston and New York seemed to have both underestimated their opponents after doing well last season. 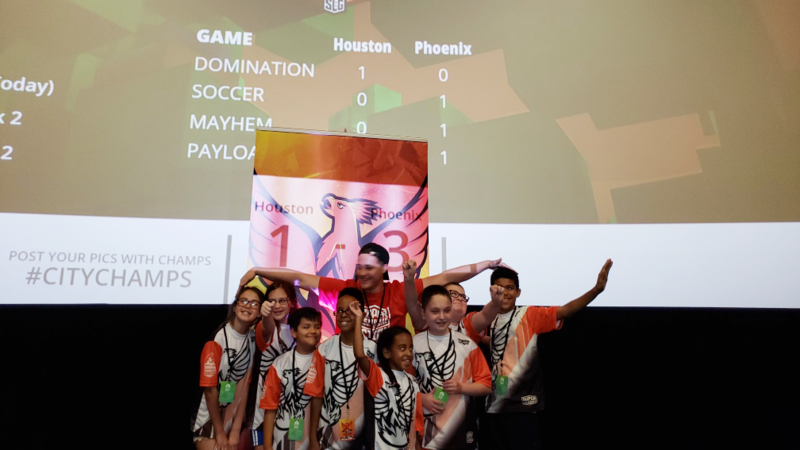 Match 3 brought upsets as Philadelphia beat Boston and Chicago beat New York, but the losing cities reestablished their dominance in Match 4. Matchup to Watch: Boston and New York are both currently tied for 1st place in their division, and we’re eager to see who comes out on top. 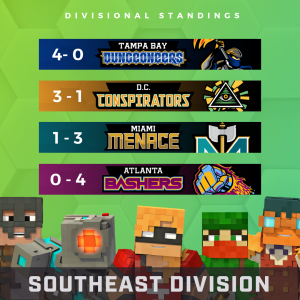 Southeast Division The Tampa Bay Dungeoneers proved that you don’t need strength in numbers to dominate Minecraft City Champs as they stand undefeated in the Southeast Division. Matchup to Watch: Tampa Bay and D.C. will be battling it out for 1st place in the Southeast Division. D.C. crushed it last season but they’ll need to win both games next week to make it out of Divisionals. 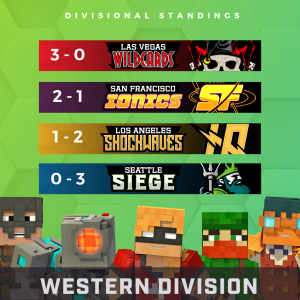 West Division All eyes are on the Las Vegas Wildcards who are currently undefeated in the Western Division. The San Francisco Ionics also took a shocking victory over the Los Angeles Shockwaves, last season’s City Champs. Matchup to Watch: The rivalry between Los Angeles and Las Vegas continues next week, but Las Vegas is standing in a much better position with its current 3-0 score. Will this be the first season LA doesn’t make it out of Divisionals? The last day of Divisional Play is this Saturday! Follow us on Facebook, Twitter, and Instagram to keep up with who’s going to make it into the Grand Final.